The new M3 Convertible. Another chapter in the M3 line-up. The new M3 convertible is not only the first retractable hard-top, but it also brags about being the first M3 Convertible to be powered by a V8. It also features the new seven-speed M Double Clutch Transmission (M DCT). 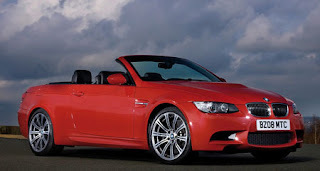 The M3 Convertible, despite having the same 4.0-litre, 420hp V8 engine as the other 2009 models, this one was built from the ground up to be a four seater Convertible supercar. The BMW M3 Convertible with the manual gearbox clocks 0-62 in 5.3 seconds and the Convertible with the M DCT gearbox gets 0-62 in 5.1seconds. The new M3 Convertible has twice the amount of power than the original 1988 model, but the spirit of the M3 remains the same. This model breaks the all important 100 horsepower per litre barrier. The power to weight is 10 per cent higher in this model than the E46 Convertible. The Convertible M3 gets 21.9mpg which is a 5 per cent improvement over the old model and it has a lot more power to boast about. The roof retracts in 22 seconds. The SunReflective leather in the new model allows the roof to be down for extended periods of time and keeps it 20 degrees Celcius lower than normal leather. The chassis is a strong tailor made version for a open-top car and the suspension has been fine-tuned to account for the weight. The car has sensors in the centre, on the B pillars and in the doors which track the movement of the car, if these feel that the car is going to roll it triggers roll bars which pop up behind the rear headrests of the car. The M3 Convertible goes for sale today (26 April 2008) at Â£54,760 ($110,000). Auto insurance quotes will be released soon. Be sure to stop by WheelHQ.com and check out their line of Replica BMW M3 Wheels.